28 x 24 x 1 in. 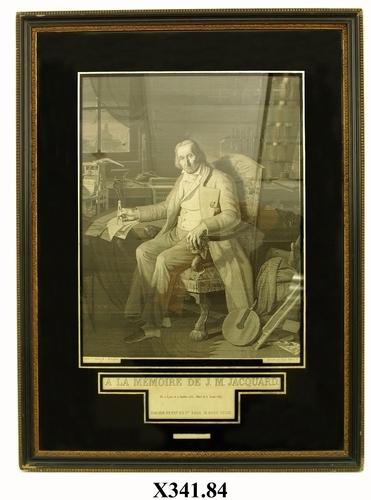 Framed picture of Jacquard seated at his work bench. Woven inscription at base of portrair reads "D'apres le tableau de C. Bonnefond; Exécuté par Didier Petit et Cie" Woven inscription in lower part of frame reads: "A LA MÉMOIRE DE J.M. JACQUARD., Né à Lyon le 7 Juillet 1752 Mort le 7 Aout 1854, DIDIER PETIT ET Cie LYON M.DCCC.XXXIX. Cisse par M.M. Garguillat.” The reverse side of the backing board (masonite) reads "Property of British Celanese Limited" in pencil. A label for the original (?) framer is attached at the base of the backing board which reads "J. Pratt & Sons, Picture Framing....Fine Art Dealer....Est. 1887, Telephone 48132, 31 Curzon Street, Derby." A similar woven portrait is in the collection of the Metropolitan Museum of Art, which describes the portrait as "Joseph-Marie Jacquard (1752–1834) invented the Jacquard mechanism, a patterning device than, when attached to a loom, made it practical to weave more detailed designs than were previously possible. This woven silk portrait of the inventor is based on a painting by Claude Bonnefond (1796–1860) that was commissioned by the city of Lyon in 1831. The Lyon manufacturer Didier, Petit et Cie ordered the silk version from weaver Michel-Marie Carquillat, who became a specialist in this kind of work. The Museum owns another woven picture after a painting by Bonnefond, showing the duc d'Aumale (son of the French king Louis-Philippe) visiting Carquillat's atelier. The silk picture convincingly portrays elements such as a translucent curtain over glass window panes."